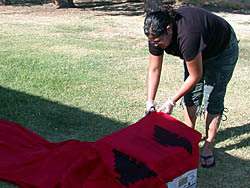 UFW Stories: "Camp Justice 2006"
My favorite UFW experience takes place at the 40 acres in Delano in 2006. A few weeks before Camp Justice came into fruition, my then supervisor, Giev Kashkooli was dreaming about a camp site where we would invite people from all over the country to the 40 acres to help us organize. And I said, “I want to goooo!” Next thing I know, I’m in the historic 40 acres in Delano setting up a camp site for 100 organizers with tents, making flags, taking care of meals, and the list goes on and on. I was running around Delano requesting donations of food and water from all the local merchants which in turn, were awarded a certificate of appreciation which they all proudly displayed—right then, I learned that it’s really about the small tokens of appreciation for many! I had so much fun taking care of the volunteer organizers and the camp site. It wasn’t easy but it was worth it! We worked from 5 a.m. to 11 p.m. day in and day out. I made long lasting relationships at Camp Justice and to this day I keep in contact with many of the organizers I had the pleasure of working with at the 40 Acres. Long story short, we need Camp Justice 2013! Who’s with me?